Yesterday was a great day (for a Monday). 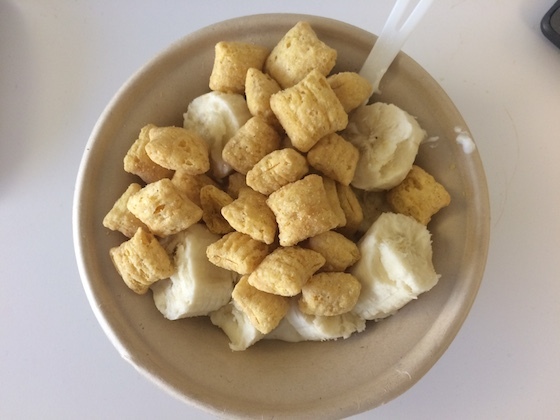 I got to the office early, and enjoyed a bowl of plain yogurt with a banana and some cereal. After much taste-testing of Greek yogurts, I’ve decided that I definitely prefer Fage to Chobani. Is it strange that I’m so particular? Or that the office stocks multiple brands of yogurt (and don’t even get me started on the number of flavors)? 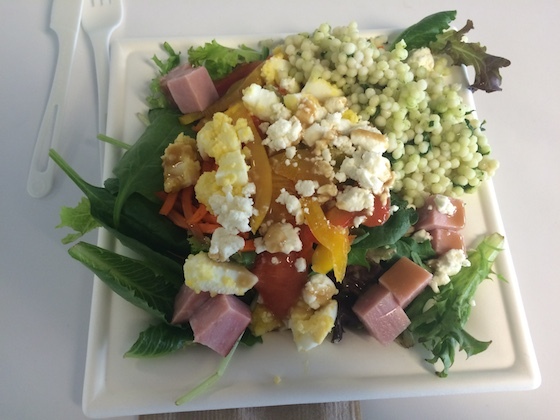 The offerings at lunch were less than appealing, so I settled for this salad. It did the trick. My lunch hour was still enjoyable, however, because I took the time to get out for a stroll. Sitting at a desk all day has started to get to me, so I’m making the conscious effort to try to move more. Yesterday I walked for 20 minutes after eating. It was really warm out, and fun to see the midday hustle and bustle of downtown San Francisco. The afternoon flew by while I worked on a project. 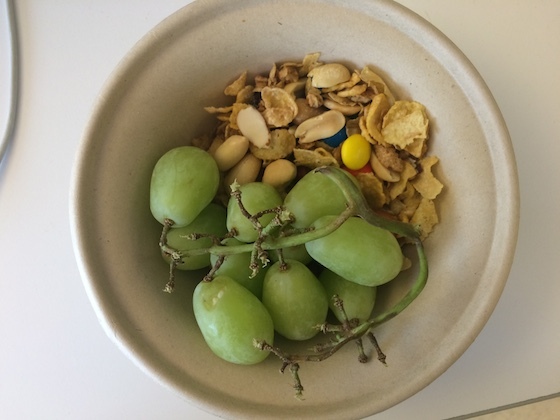 I stopped for a couple minutes for this quick snack of a bunch of green grapes and a handful of trail mix (with a little Honey Bunches thrown in for good measure). I was able to leave work a little earlier than normal, and I got to the BART station just as my train was pulling in – I love it when that happens. The walk back home through Berkeley was so pleasantly refreshing. I had plenty of time to cook a real dinner. 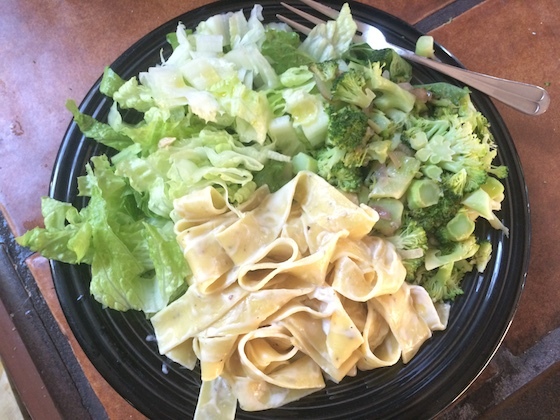 I tossed Trader Joe’s lemon pappardelle with goat cheese and a little olive oil, cooked broccoli with sautéed shallots, and added a large salad on the side. All of it was delicious! I realized that with this plate and my salad for lunch, I certainly got my fill of greens for the day. These are so colorful. Is the Berkeley bowl still around to get colorful food that allows Coloring Each Season with Healthy Food? Yes, the Berkeley Bowl is still going strong! They actually recently opened another branch in West Berkeley. We’re lucky to have so many great places to get delicious produce.